Joel Moon, Anthony Mullally and Harry Newman have been drafted into Leeds Rhinos’ squad for Friday’s Bedfred Super League clash with St Helens at Emerald Headingley, as Richie Myler, Mikolaj Oledzki and Brett Delaney all drop out. Moon has not featured for the Rhinos since suffering an Achilles injury at the Dacia Magic Weekend while Mullally has completed his suspension picked up during the Ladbrokes Challenge Cup quarter-final win over Leigh Centurions. Newman comes into the squad for the first time this season after his successful spell on dual registration with Featherstone Rovers. The young centre, who made his Super League debut last season, has scored nine tries in eight appearances for Rovers in the Betfred Championship and has also notched up an impressive nine tries in six games for the Rhinos Under-19s this campaign. Oledzki and Myler are both recovering from concussion suffered in last week’s loss to Huddersfield Giants and Brett Delaney is ruled out with a hamstring injury. 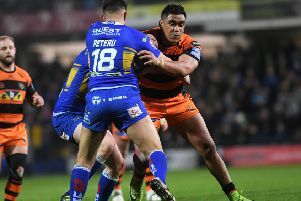 In addition to those three, Leeds are still without Kallum Watkins, Brad Singleton, Carl Ablett, Jamie Jones-Buchanan, Jimmy Keinhorst and Nathaniel Peteru. Rhinos squad: Golding, Briscoe, Sutcliffe, Hall, Moon, Cuthbertson, Parcell, Ward, Dywer, Mullally, Garbutt, Ferres, Handley, Ormondroyd, Walker, Lilley, Newman, Smith, Walters.